KFC had shut its 60 outlet­s in 21 cities of Pakist­an on Friday in hopes of being spared from public wrath, but failed. NEW YORK: Having suffered from public wrath in the past when its outlets have been burnt, Kentucky Fried Chicken, commonly known as KFC, decided to shutter its outlets in Pakistan on Friday, CNN reported. Yum! Brands, which owns the fast food chain globally cited the damage one of its outlets suffered during protests in Libya as the reason behind shutting its outlets in Pakistan. However, the move did not prevent its outlets in Pakistan from escaping unscathed. 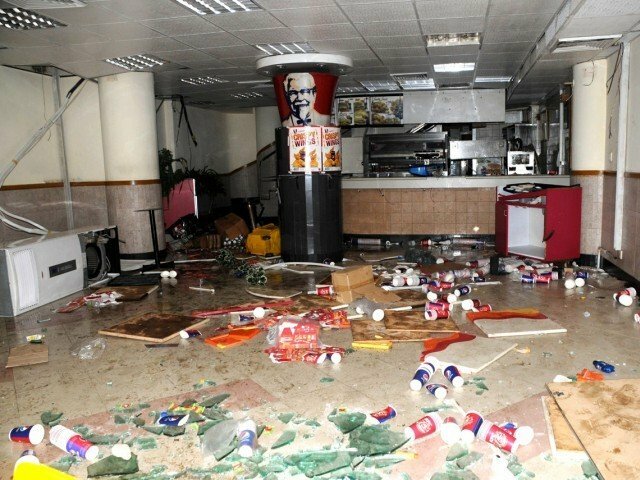 A KFC outlet near PIDC in Karachi was damaged by angry rioters who managed to break into the outlet and vandalise the interior. 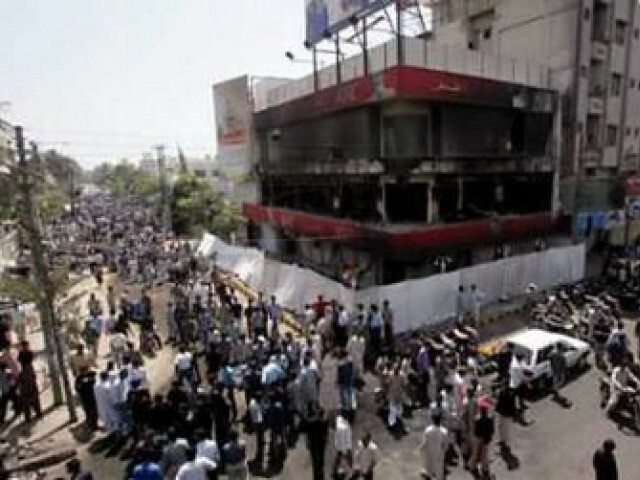 KFC has over 60 outlets in 21 Pakistani cities, many of which descended into violent protests on Friday. The chain is not new to violence at the hands of protesters and rioters in Pakistan. Twice it has suffered the wrath of angry mobs. In 2005, an outlet was burned in Karachi. Another outlet was burned in the same city in 2009. Correction: An earlier version of this article incorrectly mentioned KFC as KCF in the headline. The error is regretted. APCNGA announced on Wednesday to observe strike on Friday to express protest over the anti-Islamic film. Around 30 protesters and 55 policemen were injured during the confrontation, according to the police. Before crying hoarse about how world treats them, Muslims need to introspect about how they treat women, non-Muslims. Please guys.. read the title of this clipping.. its KFC and not KCF!!! You wrote this article in such a haste. KCF ? The tile should read KFC instead of KCF. Good we dont deserve good food. “Cited the damage one of its outlets suffered during protests in Libya as the reason behind shutting its outlets in Pakistan.” Damage suffered in Libya, outlets closed in Pakistan? What kind of reaction that is? Throw out these imperialistic exploiters of Pakistanis. Pakistan does not need their poison. Protest in high security zone? Something fishy. Those who condone arson and looting should be in jail. and most of the people here has problem with spellings but not with what happened to KCF or KFC. best way to display love with the Prophet is to become as rowdy as possible, burn properties of our own ppl, possibly kill our own people….destroy any possible chances of letting a poor man remain employed….. I dont think it is of any use to write here because ppl wont read it…but any of these hooligans ever thought of the consequences….? ppl employed in these places are ordinary pakistanis struggling with daily life and with this thing damaged they might not have work…. I request them to continue with thier crazy ways but not use Prophets pure name for all this…..